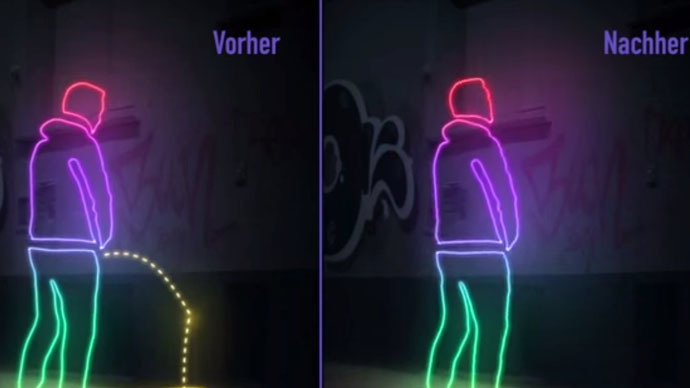 Residents of St Pauli, the notorious Hamburg party hub, are taking revenge on the drunken partygoers who have for years been urinating on the neighborhood’s buildings and streets, with a high-tech paint that sends the urine bouncing right back. Local community group IG St Pauli cooked up this unorthodox method to combat shameless public urination after residents realized that traditional tactics weren’t deterring messy drunks from relieving themselves all over the neighborhood. The hydrophobic paint, also used in shipbuilding, deflects any liquid that comes into contact with it, meaning those who pee on surfaces will find their own urine shooting right back at them. St Pauli welcomes some 20 million visitors each year, many of whom forgo its slew of trendy cafes and shops in favor of the seedy bars and strip clubs in its red light districts, the Reeperbahn. "This paint job sends a direct message back to perpetrators that their wild urinating on this wall is not welcome,"Julia Staron, one of the group’s organizers, told Reuters. "The paint protects the buildings and the residents and most importantly it sends a signal this behavior is not on." Group members covered the lower walls of some of the Reeperbahn’s, most popular peeing spots with the paint known as Ultra-Ever-Dry. Signs warning revelers have been posted on some of the walls treated with anti-pee paint. However, the group recommends that partygoers stay vigilant and refrain from peeing in public at all as not all walls are marked with signs. A video detailing the campaign drew almost 200,000 views in just two days. Though the campaign is only a few days old, IG St. Pauli believes that most in the neighborhood welcome the move. "I've seen in Facebook and the local newspapers that the reactions were very positive. People were just tired of the peeing on walls, home entrances and playgrounds," IG St Pauli board member Uwe Christiansen told the Local.